The 27th WPC is over. Like the last time I did this, there’ll be some criticism (as there would have been for the two past years), so let me thank the authors and organizers right away for the terrific job they did. I’ll go through the competition round by round again, covering rounds 1 through 3 (morning of day 1) in this post. Like last time, I’ll compare to the 10th best score of each round. That value is reasonably unaffected by the out-of-this-world scores at the very top. A round of 11 shading puzzles, with about half high pointers (75-110) and half what appeared to be scraps (10-50). My plan was to start with some of the low high-pointers in types I enjoy and see where to go from there. During the round it felt like this backfired: I started with the last puzzle, a 75 point Kuromasu, couldn’t get anywhere, and moved on quickly. Flipped forward to the Coral (110), the highest pointer, and thought I found a decent break-in there which turned out not quite correct. After spending some 5 minutes here, I gave up and tried the Cave (80). By this point I’d made the usual mistake (?) of giving up on expecting logic, which made me give up on this one quite early, too. With 0 points after probably 10 of 45 minutes, I decided to cut my losses and try getting into the competition by solving the easy puzzles. LITS (15), Tapa (10) and Nurikabe (20) did come out easily. I think it was at this point I decided to risk some of the high-pointers again, since the remaining low-pointers didn’t exactly play to my strengths (Hitori (30), Aquarium (35) and All or Nothing (50)). So I tried the 2018-themed Heyawake (80), where I didn’t find much by way of a break-in, tried something which seemed reasonable, and half-guessed my way through the puzzle, deciding to just leave it like this because there was no way I wanted to work on that one more. Then I moved to the first puzzle of the round, a Shakashaka (85) on a large Czechia-shaped grid. I could deal with the gimmick (triangular empty cells) well, making this a pleasant medium-difficulty solve. For the remainder of the round, I worked my way through Aquarium (35) and All or Nothing a.k.a. Crazy Pavement (50) with more casework than I’d like. (Thankfully, I was aware of the croco-like Aquarium rule of a constant height of water through regions; that caught out some people.) I believe I spent the last few minutes trying the Kuromasu again, but that was it. I came out feeling rather bad about my performance, particularly hearing Endo Ken finish with 4 minutes to go. This was moderated after talking to my team mates who had all struggled, and ultimately this was an average performance for me, with 83% of the 10th best score. A good part of the puzzles were at an unreasonable level of difficulty/caseworkiness with the Heyawake, Coral and Kuromasu. The Shakashaka variant was probably fine, but is it really necessary to do something like this as the first puzzle of a championship? A lack of medium difficulty puzzles, and half of the medium-difficulty points were the Shakashaka that some people failed due to the rule weirdness. Some of these points are debatable, e.g., I don’t think there’s general consensus that puzzles should have a reasonable logical path, and/or that they should be not too difficult. In so far the round as such was ok, but I do rather disagree with opening up the tournament with it. If the top solvers struggled, how must this have felt to to the rest of the 250 participants? I guess it means you feel better about the following rounds, but I’m not convinced. The rest of the round was a sprint through easy puzzles, which I went through front to back, skipping the Overlapping Squares (15, 55). 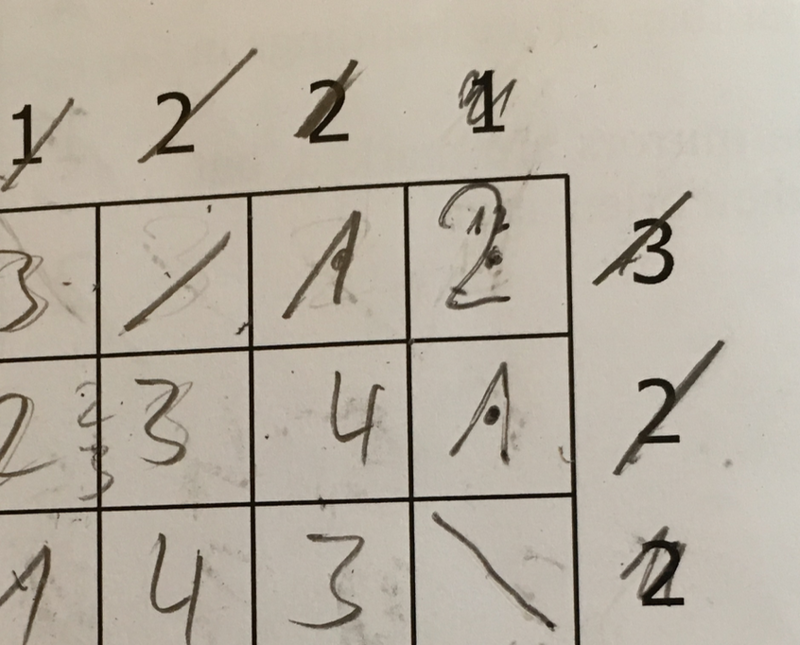 Time was almost over when I reached the last puzzle, Arrows (25), so I went back and solved the small Overlapping Squares. Aside from the Scrabble, the memorable solve in this round for me was Lighthouses (45), which had a nicely non-trivial but smooth solve for me. The large Overlapping Squares was also a good one. Naturally, this round felt a lot better than Round 1. I feel it would have made for a more friendly opening round. Palmer Mebane was the only one to finish this round, with no bonus, while Ken missed the Scrabble (possibly due to an error?). I made a stupid error finishing up the Hashi (20), but still this was a good round. The last pre-lunch round was an hour of skyscraper puzzles. 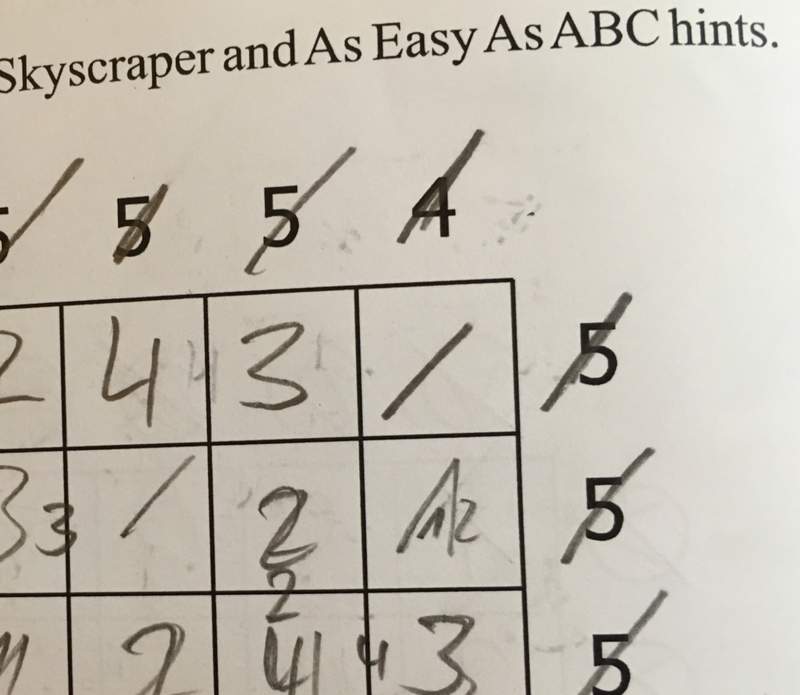 While I’m not particularly strong with latin square puzzles, I did expect a decent result here due to the German experience with skyscraper puzzles thanks to Roland “Hochhausigel” Voigt. I didn’t have any particular preferences here, so I just went through from start to finish (I wish). First was a batch of 5 Skyscrapers with Mirrors in different interpretations. Skyscrapers with GT hints is also an interesting idea, while the Skyscrapers / As Easy As ABC hybrid was a bit confusing, particularly when I started confusing my “gap” marking with the earlier “mirror” marking. I seemed to work my way through the Myopia Skyscrapers (55), a type that’s very… unübersichtlich. Not entirely surprising that I made a mistake here. 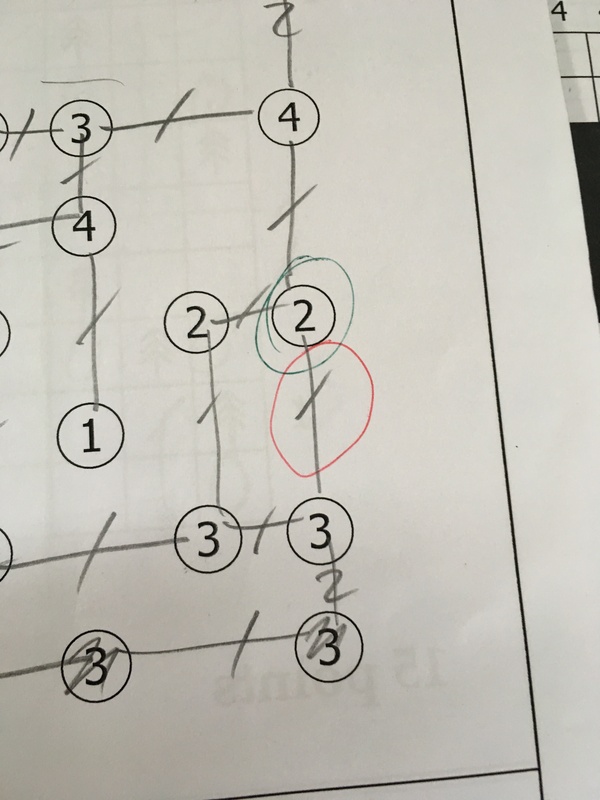 After puzzle 11 (Stroll among skyscrapers), time was almost up, and I guessed myself to a contradiction on a Sky Coral (30). I never got around to trying the Skyscrapers – First Invisible (25), which I had made a practice puzzle for. This ended up being another decent round for me, with 80% of 10th best. Unsurprisingly Ulrich topped the round, finishing 9 minutes early. Regarding the puzzles, it’s a bit hard to choose favorites. While there some neat ideas in terms of new variants, the fact that almost all puzzles had full clues given makes it hard for me to really like them. That just shifts solving from logic to searching too much for my taste, and hides the author’s style. (Compare the series of puzzles with full clues I ran on croco-puzzle a while back.) 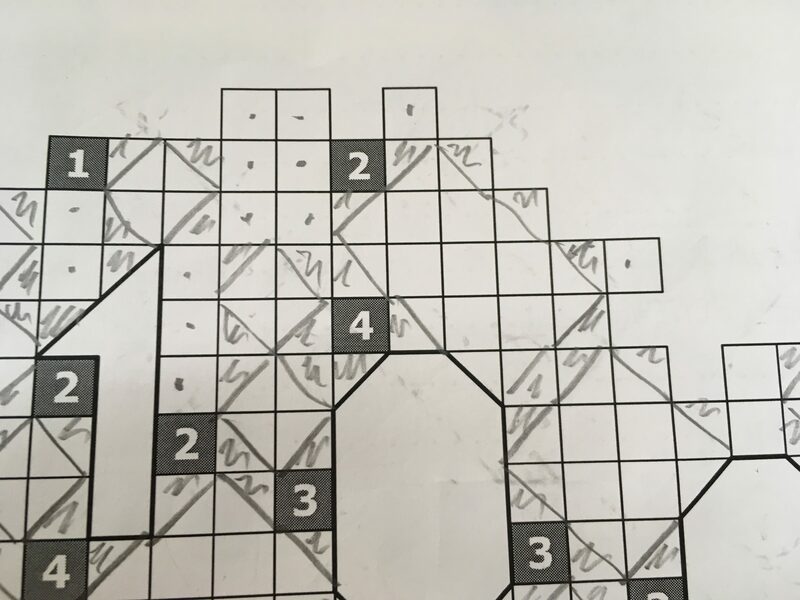 These fully clued puzzles were a theme throughout the contest, presumably a consequence of the construction style of starting with a solution grid, adding all clues, and verifying that you end up with an ok puzzle. That’s it for now, I’ll be back after lunch with three long afternoon rounds. This entry was posted in Puzzles and tagged report, wpc on 2018-11-14 by rob. I have to say I was never sure, throughout the championship, if I needed to stare and deduce more, or write and try more. Faced with this uncertainty, I erred on the side of trying to an unpleasant extent, a practice the first round seemed to reward. That Shakashaka was the easiest points of the championship for me, and an encouraging way to start. I do agree that many rounds seemed to be light on medium difficulty puzzles. My team being even thinner than usual had a few rounds where they kind of ran out of productive uses of their time.